While many of us are dreading the freezing, cold weather winter brings, the season can also create some of the most beautifully surreal landscapes. Ice caves are a spectacular result of ice and snow (sometimes, with a little help from man), and while some are more challenging than others to visit, they are some of the world's most popular tourist destinations. For a unique, unforgettable way to "chill out," explore these amazing ice caves. Known in German as "The World of the Ice Giants," Eisriesenwelt is the largest ice cave in the world. It was created over millions of years by water erosion that continues to this day. According to Atlas Obscura, the caves were once thought to be an entrance to hell and weren't explored until 1879 because people worried where the tunnels would take them. Tourists visiting the Austrian caves today don't have to worry much about hellfire. Eisriesenwelt actually hovers around 32 degrees Fahrenheit all year around, no matter how warm it might be outside. Visitors can reach the caves by taking a minibus up to the park, or by walking the entire way, although this is a challenging trek, says Lonely Planet. Once at the cave, hikers will be led on guided tours over about 1,400 stairs. 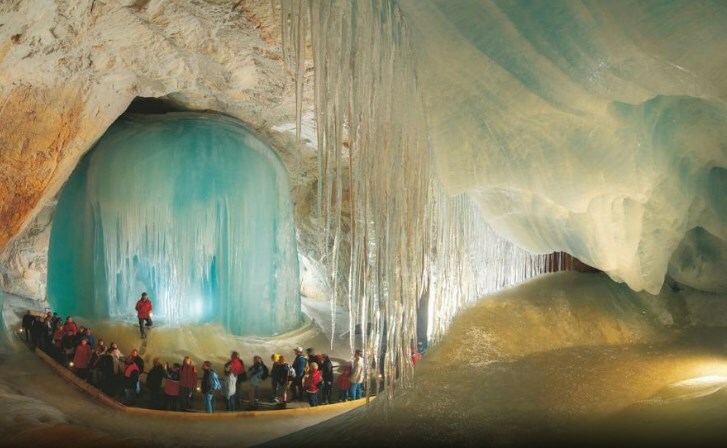 To help preserve the cave, only handheld carbide lamps and magnesium lamps are used to illuminate the fantastic ice sculptures, says the Eisriesenwelt website. Mer de Glace, which translates to "Sea of Ice", is located in the Chamonix valley and is France's largest glacier. For visitors who come specifically to see a world in the ice, a small cable car takes visitors from a train station down on the Glacier itself where they can enter an ice grotto cut into the glacier. According to the Chamonix Networks, the man-made ice cave is dug out every summer and is filled with crystal samples from the Mont Blanc massif. The Grotte de la Mer de Glace cave is illuminated with colorful lights, providing a stunning display for hikers. Visitors can also hike along the glacier with a guide and learn about the lives of those who call the mountains their homes, says the Compagnie du Mont-Blanc. The Rhone Glacier is one of the Swiss Alps' oldest glaciers, believed to be 11,500 years old, and is home to a stunning ice cave visited by tourists every year. The attraction is actually carved into the glacier every summer since about 1870: a glistening, blue tunnel that runs for more than 300 feet through the ice, according to the Agence France-Presse (AFP). But scientists say the Rhone Glacier may be in trouble. Over the past 150 years, the massive ice chunk has retreated tremendously because of climate change and rising global temperatures. In attempt to protect this important block of ice, and the ice cave, scientists are covering it with "ice blankets" each summer. The blankets are said to help keep the sun rays from hitting the glacier and slow down its melting rate. Formed by lava flows from an eruption of Mt. Fuji in 864, Japan's Narusawa Ice Cave is a popular destination during the country's sweltering summers. It's not a surprise, especially since the average temperature in the cavern is about 3 degrees Celsius (about 37 degrees Fahrenheit). It is believed that in the 1900s, the cave, which is home to spectacular ice pillars that reach three feet in height and peak in April, was used as a storage space for ice before the advent of refrigerators. Located only 12 miles from downtown Juneau, the vividly colored ice caves of the Mendenhall Glacier are among the most spectacular sites on Earth – if you're willing to make the trek to see them. According to Slate, reaching the Mendenhall ice caves involves a kayak journey, then a long hike and ice climb. Making the caves an even more invaluable destination is the fact that they might not be in existence much longer. The Mendenhall Glacier has been monitored by the Juneau Icefield Research Program for more than 60 years and receded almost two miles in the past 50 years, compared to a half a mile since 1500, reported Atlas Obscura. If you're fit enough to take on the the glacier, Travel Juneau tour operator offers treks by canoe or kayak and Alaska Tours has a gentle white water rafting tour for up to 12 passengers at once. If you'd rather see the ice caves from afar where there's no chance of the ice melting and falling on you, check out this video captured by a drone that flew through the caves. Stretching across the Austral Andes of Argentina on the border with Chile, Los Glaciares National Park is a natural world wonder that was first recognized by UNESCO in 1981. The glaciers that give the park its name are the largest continental ice extension after Antarctica, says the park website. One of the biggest glaciers, Perito Moreno, advances and collapses in a repeating four-year cycle, creating chunks of ice that float away as icebergs reported PBS. In addition to exploring the natural ice caves that are formed by the moving glaciers, tourists can go camping, fly fishing and horseback riding in the park. Guides can also teach tourists about the natural history of the park and point out edible berries and local fauna, said the New York Times. For a true cave system filled with beautiful natural ice sculptures, Dobsinska, Slovakia is a must-see. The ice appears in stalagmites, columns and waterfalls, filling the halls and corridors of the cave. Explorers first descended into the cave in 1870 and brought electric lights into the chilly underground tunnels in 1881. The cave was used to give concerts, for tours and for summer skating, says the Dobsinska website. Entrance for an adult into the cave is 7€ and the cave is open every day from May 15 to September 30. Appearing around midsummer every year, the Big Four Ice Caves in Washington are located off of a trail in the Cascades and formed by warm winds and melting ice hollowing out heaps of avalanche snow. To reach a safe viewing area for the caves, the USDA Forest Service says to cross the South Fork of the Stillaguamish River on a footbridge and go past the forest, as long as there are no avalanche warnings. The USDA advises that the caves should not be approached because rock and ice fall present hazards throughout the entire year. Although hikers are warned to stay away from the caves themselves, the trail that leads there and the viewing area can be just as beautiful and enjoyable as entering the caves. Trekkers will see wetlands filled with birds, an open forest and the ruins of an old hotel, says the Washington Trails Association. A karst cave located in the Urals, near the town Kungur in Perm Krai, Russia, the Kungur Ice Cave is frozen in what has been described as an "everlasting winter." Featuring an incredible array of stalagmites and stunning ice formations, and home to about 50 grottoes and 70 lakes, the cave stays frozen even when it's 95 degrees F outside, according to The Daily Mail. One of the most popular grottoes in the cave is the one called "Brilliant," which is illuminated with crystals lit in different colors. Another grotto called "Titanic" features a huge, underground lake. In Wisconsin, freezing-cold weather can be a plus. In cold winters, when the conditions are just right, visitors can hike across frozen Lake Superior to explore the Apostle Islands mainland sea caves, which the National Park Service call a "fairyland of needle-like icicles"— a fairyland of spectacular ice formations, frozen waterfalls, and glistening icicles. Visiting the caves in winter requires at least a 2-mile hike (round trip) on the ice of Lake Superior, according to the NPS. Apostle Islands National Lakeshore staff checks the ice and monitors the weather to determine when the Mainland Caves are accessible. Before planning a visit, call the Ice Line for the latest conditions, 715-779-3397 ext. 3., and check the Apostle Islands National Lakeshore website. Fox Glacier in New Zealand has a reputation for being one of the most accessible glaciers in the world, and one of the most popular tourist attractions. But don't be daunted by the crowds; the reputation is well deserved and it's worth making the trip if you're on New Zealand's South Island. According to New Zealand Tourism, Fox Glacier reaches a low altitude and has a high snowfall at the top of the glacier, meaning it moves ten times faster than most valley glaciers. This also makes the glacier dangerous, and hikers should be aware of the risk of leaving marked paths or going out without guides. Some examples of tours include an overnight alpine trek, a helicopter hike that brings you to remote regions of the glacier, or an ice climbing adventure, all through Fox Glacier Guiding. 0 Response to "11 Spectacular Ice Caves Around the World "